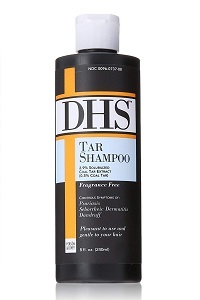 DHS Tar Shampoo helps prevent recurrence of scalp itching and flaking associated with Psoriasis, Seborrheic Dermatitis, and Dandruff. Wet hair thoroughly; apply a liberal amount of DHS Tar Shampoo and massage into lather. Allow lather to remain on scalp for several minutes. Rinse hair well and repeat application. For best results use at least twice a week or as directed by a doctor. Purified Water, Sodium Laureth Sulfate, Cocamiopropyl Hydroxysultaine, PEG 8 Distearate, Sodium Chloride, Citric Acid.